Recommended to: Fans of down and dirty science fiction mixed with steampunk. EXPERIENCE THE ULTIMATE IN VIRTUAL REALITY. The Demi-Monde is the most advanced computer simulation ever devised. Created to prepare soldiers for the nightmarish reality of urban warfare, it is a virtual world locked in eternal civil war. Its thirty million digital inhabitants are ruled by duplicates of some of history's cruellest tyrants: Reinhard Heydrich, the architect of the Holocaust; Beria, Stalin's arch executioner; Torquemada, the pitiless Inquisitor General; Robespierre, the face of the Reign of Terror. But something has gone badly wrong inside the Demi-Monde, and the US President's daughter has become trapped in this terrible world. It falls to eighteen-year-old Ella Thomas to rescue her, yet once Ella has entered the Demi-Monde she finds that everything is not as it seems, that its cyber-walls are struggling to contain the evil within and that the Real World is in more danger than anyone realises. 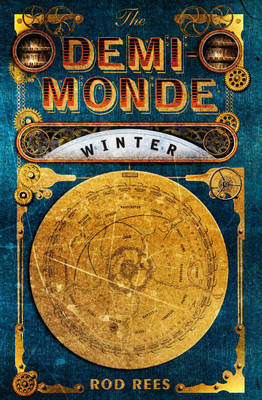 Oh The Demi Monde: Winter, what do I say about you first? It's pretty obvious straight away that this is a very lengthy read. I'm a fan of Science Fiction and therefore I'm used to reading books that border on tomes. Still, I'm certain that many people are going to be scared off immediately by the hefty weight of this book. At 522 pages, this is definitely not a light read. That being said, the book actually starts out very well. From the first page the reader is thrown into a skewed world that mirrors our own, but is infinitely more terrifying. Imagine a place where the worst villains the most reviled of historical figures, make their home. A land where racism and sexism run rampant. All created by the government to fit into a training simulation for soldiers. The most advanced simulation ever seen, with the power to think for itself. Sound scary? Ella Thomas thinks so too, and yet she's headed in. Now the real problem I found with this book was that Rod Rees was too ambitious. I know this sounds odd, but he packs so many different tropes into this story that after a while it becomes difficult to follow. I loved Ella. I loved everything about her intelligent schemes and daring escapes. Honestly, if the book had just followed her I would have been just fine. However there are social classes to remember, slang terms for different races, city names, wars, dates, and endless amounts of other information. If I was wondering why this book was so long, I found my answer. The fact is, there are a lot of great things in this book. Wonderful characters, twists and turns. It just all happened to be buried under a lot of information that felt like it didn't need to be there. I skimmed a lot of this story if I'm being honest. Fact is, the parts I read still made up a whole story that was amazing. So now you see why my rating is where it is. Kudos to Rod Rees for taking on such an ambitious project, but perhaps the next book should have a little less in the info-dump department so the page count goes down.